No previous programming or electronics knowledge is required for this course! All electronics concepts and programming for each project will be explained step-by-step in detail. You will get the complete picture and it is a much better way to learn Arduino by creating full working projects from scratch! The course is broken up into a Simple Projects section, an Intermediate Projects section and an Advanced Projects section allowing you to progress to or start from any level based on how comfortable you are with Arduino. If you are new to Arduino, the first lessons will get you quickly up to speed on what the platform is and how to use it. You can then progress to simple projects which get you comfortable with basic electrical components. For those already familiar with Arduino who want to take their skills to the next level, you can jump straight to the intermediate projects section. There, we will focus on making game-type projects using the Arduino and even an infrared repeater that can allow you to copy, store, and playback any IR signal, just like your own universal remote. Next, for those that might be already comfortable with Arduino, there is an advanced projects section where we tackle projects like an online weather station, remote-controlled car that you can drive with a smart phone app, and a working phone that can make actual calls and send text messages and many more. I have always believed that project-based learning is the best approach where you actually learn by doing and building something that actually works. This is the approach I am taking in this course. I will explain all the electronics principles involved with each project, show you how to wire up the circuits and give detailed line-by-line code reviews on how it all works. If you already have an Arduino or by purchasing an Arduino Kit (about $35 US), you will get most of the components needed to complete at least 80% of the course. The more advanced projects will require some additional parts but they are all really affordable. A detailed parts list by project and for the course is provided once you join the course, with links to online suppliers that are kept up to date. You can buy all the parts at once or select which advanced projects you want to work on and obtain only the specific additional components you need based on your electronics collection. Someone who is interested in learning about Arduino. 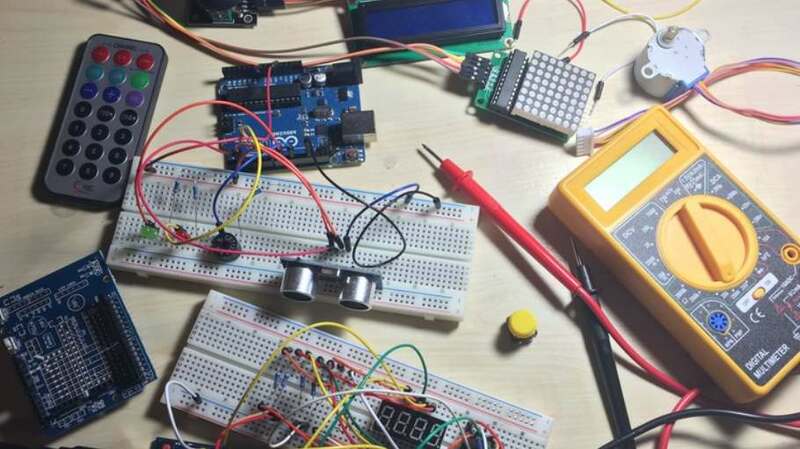 Get your #Free #Udemy Course on Arduino Bootcamp : Learning Through Projects by clicking here.